3785a, CENTER CAP USED, 09-11, FORD, F150, CHROME CAP, FORD BLUE OVAL, 6 CUTOUTS FOR LUG NUTS, 6 PLASTIC CLIPS WITH WIRE, 5-1/4" DIA. 5228a-1, CENTER CAP SILVER USED, 05-08, CHEVY, COLORADO, SPARKLE SILVER PLASTIC CAP, RAISED BOWTIE, 6 CUTOUTS, 6 PLASTIC CLIPS, WIRE RING, 5-1/2" DIA. 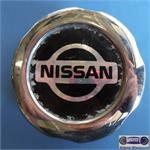 62336/62344, CENTER CAP USED, 96, NISSAN, PATHFINDER, CHROME PLASTIC CAP, BLACK BACKGROUND, CHROME WORD NISSAN IN BLACK, 5" DIA. 62344R, CENTER CAP REAR USED, 97-99, NISSAN, PATHFINDER, CHROME PLASTIC CAP, BLACK BACKGROUND, CHROME WORD NISSAN IN BLACK, 6 CUTOUTS, 5" DIA. 62344r, CENTER CAP REAR USED, 97-99, NISSAN, PATHFINDER, CHROME PLASTIC CAP, WITH BLACK BACKGROUND, CHROME LOGO, WORD NISSAN IN BLACK, 6 CUTOUTS FOR LUG NUTS, 6 PLASTIC CLIPS, WIRE RING, 5" DIA. FOR A 15" RIM, ALSO FITS 62336, 62341. 62380a-2-R, CENTER CAP REAR COPY, '00-'01, NISSAN, XTERRA, PLASTIC CAP, SPARKLE SILVER, RAISED, ENGRAVED BLACK WORD NISSAN, 5" DIA. 64691r-a, CENTER CAP REAR USED, 87-93, MAZDA, B2600, 4X4, BLACK PLASTIC CAP, 6 FAKE KNURLED SCREW HEADS, BRONZE CENTER. WORD MAZDA, 4-3/4" DIA. 64691r-a, CENTER CAP REAR USED, 87-93, MAZDA, B2600, 4X4, BLACK PLASTIC CAP, 6 FAKE KNURLED SCREW HEADS, BRONZE CENTER & THE WORD MAZDA IN CENTER & CHROME RING ON OUTSIDE OF WORD, 6 CUTOUTS FOR LUG NUTS, METAL CLIPS, 4-3/4" DIA. 69503, CENTER CAP USED, 07-08, TOYOTA, FJ CRUISER, MACHINED FINISH, PLASTIC CAP, 6 CUTOUTS FOR LUG NUTS, 6 PLASTIC CLIPS, WIRE RING, 5-1/2" DIA. 69503, CENTER CAP USED, 07-08, TOYOTA, FJ CRUISER, MACHINED FINISH, PLASTIC CAP, 6 CUTOUTS FOR LUG NUTS, RAISED CHROME LOGO, 6 PLASTIC CLIPS, WIRE RING, 5-1/2" DIA. FOR A 17" RIM. 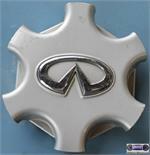 73675b, CENTER CAP USED,17", 02-03, INFINITY, QX4, SPARKLE SILVER PLASTIC CAP, 6 CUTOUTS FOR LUG NUTS, RAISED CHROME LOGO, 5-1/2" DIA.